“Percy's Pet Pugusaur Pete, bully eradicator” from Christian Faith Publishing author Charles E. Pickens is the story of a little boy and girl who find a very special new friend. Bullying will never be a problem for them again. “Percy's Pet Pugusaur Pete, bully eradicator”: a fun-filled adventure about two youths who find a unique way to stop bullying in their neighborhood. “Percy's Pet Pugusaur Pete, bully eradicator” is the creation of published author, Charles E. Pickens. Charles received an Associate of Arts Degree in Long Beach, and a Bachelor of Arts degree in Pasadena, California after his military career ended in 1980. 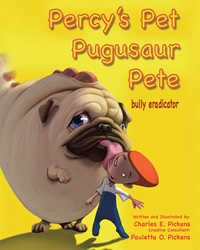 “Percy’s Pet Pugusaur Pete, Bully Eradicator” is his second published book. His first book, “Vermin, Darkness Prior to Priorities,” was published in 2004. Since 1993, Charles has worked as a professional illustrator for several major film and animation studios in Los Angeles and Burbank, California. His career includes eight years of full-time employment at Warner Brothers Animation and ten years at Walt Disney Publishing. He currently works as a freelance illustrator, writing and illustrating children’s books. Animation and children’s books have played a major role in Charles’ life throughout his entire professional career. Published by Christian Faith Publishing, Charles E. Pickens’s new book offers a unique spin into the issue of bullying. Percy and Nelly accidentally stumble upon a secret portal that takes them into a strange new world. While exploring, they discover a rather odd and mysterious creature. They decide to return home with their discovery. View a synopsis of “Percy's Pet Pugusaur Pete, bully eradicator” on YouTube. Consumers can purchase “Percy's Pet Pugusaur Pete, bully eradicator” at traditional brick & mortar bookstores, or online at Amazon.com, Apple iTunes store, or Barnes and Noble. For additional information or inquiries about “Percy's Pet Pugusaur Pete, bully eradicator”, contact the Christian Faith Publishing media department at 866-554-0919.